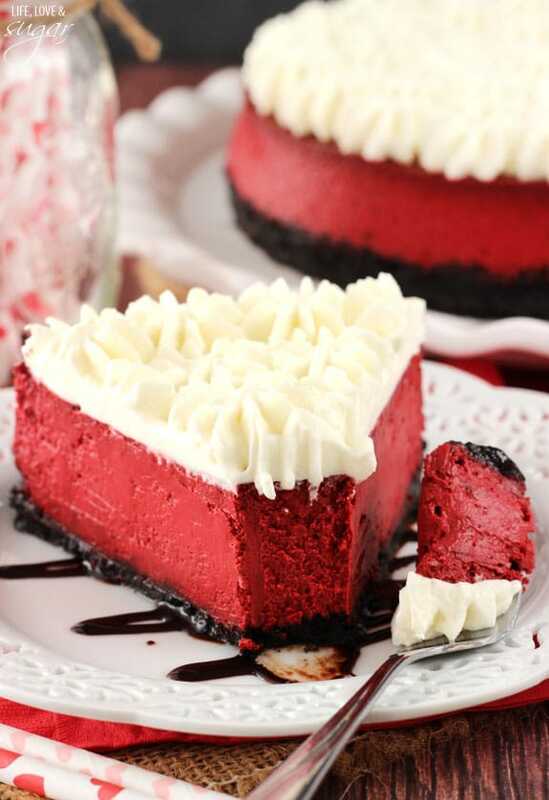 This Red Velvet Cheesecake is one of the smoothest and creamiest cheesecakes I think I’ve ever made. It is insanely good and has the light tang that is so loved in a red velvet dessert. The cream cheese whipped cream on top finishes it off perfectly! 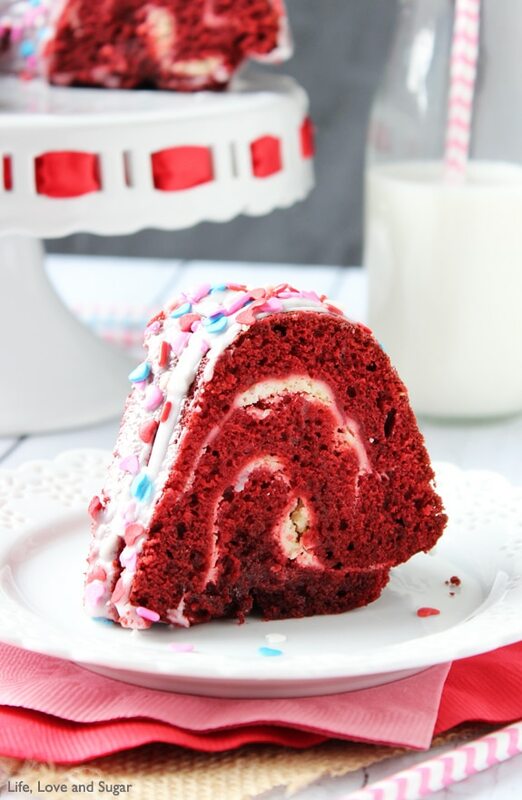 Red velvet is one of those flavors that people seem to either love or hate. Some people are just like, red what? That’s a cake? And some people think it’s basically the same thing as chocolate. It’s kind of like the mystery cake flavor. What I really love about it is the tang from the buttermilk and the slight flavor of the vinegar. I don’t know how to exactly describe the vinegar taste since it’s not like you’re actually eating vinegar, because that would be gross. 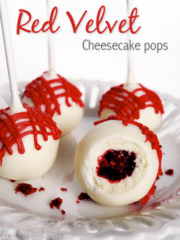 But it ads a very specific flavor that I’ve come to really love in red velvet. I didn’t grow up eating red velvet, but as I’ve tasted it at various places over the last few years and made a number of desserts with it, I’ve come to love it. 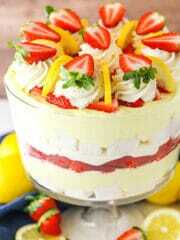 As a cheesecake, it’s wonderful. I went with a chocolate crust to start. Though red velvet really only has a very small amount of chocolate in it, I think the chocolate crust compliments it nicely. For the cheesecake, I started with my usual base and went from there. 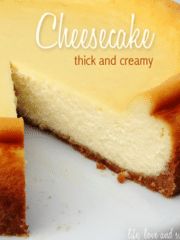 It’s a wonderful base that has been turned into many a cheesecake flavors. I added a little cocoa, some buttermilk, vinegar and of course, the red coloring. 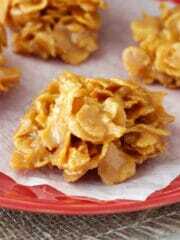 One thing to keep in mind when mixing the filling is to not over mix the batter and to not mix at a high speed. Both can add additional air to the batter, which is a common culprit of cracks. And as much as I hate it, this recipe calls for a water bath. I’m never a fan of extra steps, but when they are necessary, I do them. For a nice, smooth, not cracked cheesecake, you’ll want to make sure a water bath is used. For the whipped cream, I used basically the same Cream Cheese Whipped Cream that I used on my Red Velvet Ice Cream Cake. I absolutely fell in love with it and couldn’t wait to make it again. I like to make my whipped cream with plenty of powdered sugar. It thickens the whipped cream and keeps it from wilting and melting. It also sweetens it up, and when have I ever complained about that? To give it the cream cheese flavor, I add 1/2 cup of whipped cream cheese icing. Not regular canned icing, but the whipped canned icing. 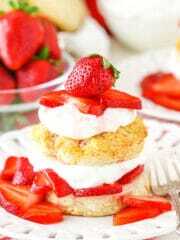 It’s lighter and fluffier and incorporates well into the whipped cream. I love it. I’d imagine regular cream cheese could be beaten until smooth and added as well, but I didn’t try it. This cheesecake was a hit. As soon as I took my first bite, I was in love. Take it from me, you’ll have a hard time stopping at just one piece. 2. In a large bowl, blend the cream cheese, sugar and cocoa with an electric mixer until combined (Use low speed to keep less air from getting into the batter, which can cause cracks). Scrape down the sides of the bowl. 4. Add the sour cream, buttermilk, vinegar, vanilla extract and red food color. Beat on low speed until well combined. 5. Pour the filling into the pan. 6. Drop the cheesecake on the counter a few times to release air bubbles that can cause cracks. 7. Place springform pan inside another pan. Fill outside pan with enough warm water to go about halfway up the sides of the springform pan. The water should not go above the top edge of the aluminum foil on the springform pan. 8. Bake for 1 hour and 45 minutes. 10. Crack oven door and leave the cheesecake in the oven for another 20 minutes or until set. 11. Remove cheesecake from oven and chill. 3. Whip until cream starts to thicken, then add powdered sugar. 4. Continue whipping until stiff peaks form, about 5-7 minutes. 5. Stir in the cream cheese icing. 6. 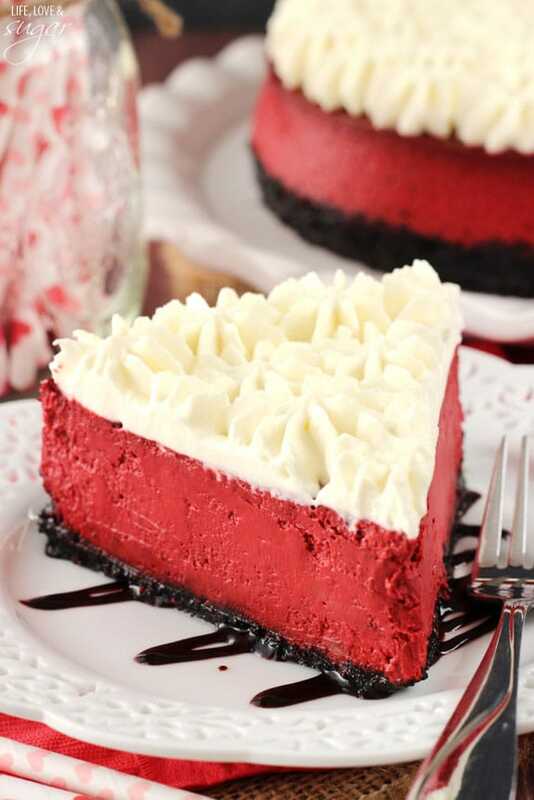 Spread or pipe whipped cream on top of cheesecake. Keep cheesecake refrigerated until ready to serve. Wow. I mean, you make a lot of showstoppers, but this is definitely one for the books! It’s beyond gorgeous. Beyond amazing. Beyond everything. Let me just tell you this looks amazing! Pinned! This cheese cake is gorgeous, Lindsay! It should really be in a bakery! 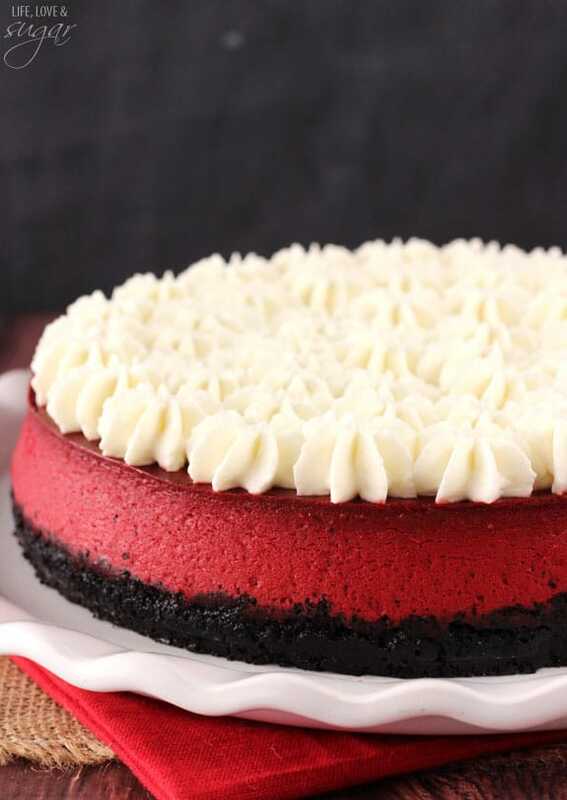 I can’t get enough of anything red velvet flavored! Love this! This is stunning Lindsay! 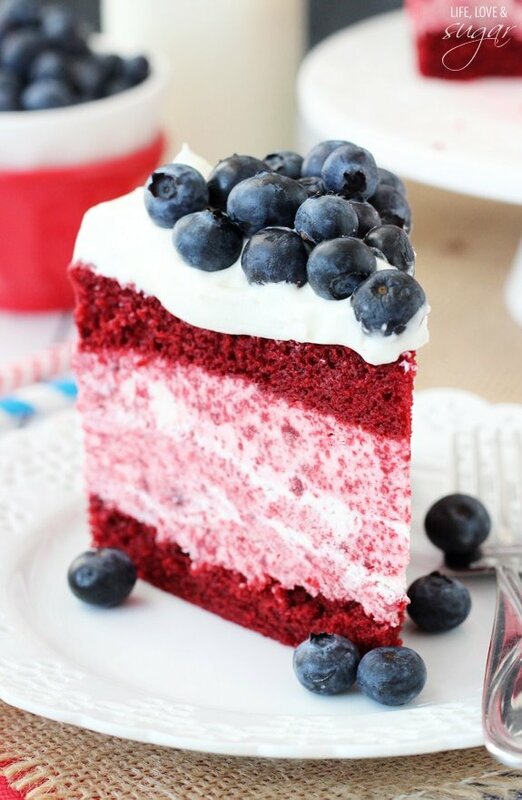 You are the Red Velvet Queen for sure. I just love staring at all your gorgeous photos! Your treats always looks so stunning! This cheesecake is no exception. It’s beautiful and perfect for Valentine’s Day! Pinning! Thanks Jen! Thanks for the pin! Girl ok so I LITERALLY have this same recipe coming out next week haha. Great minds. I would give anything for a slice of this right now. It is perfection girl. 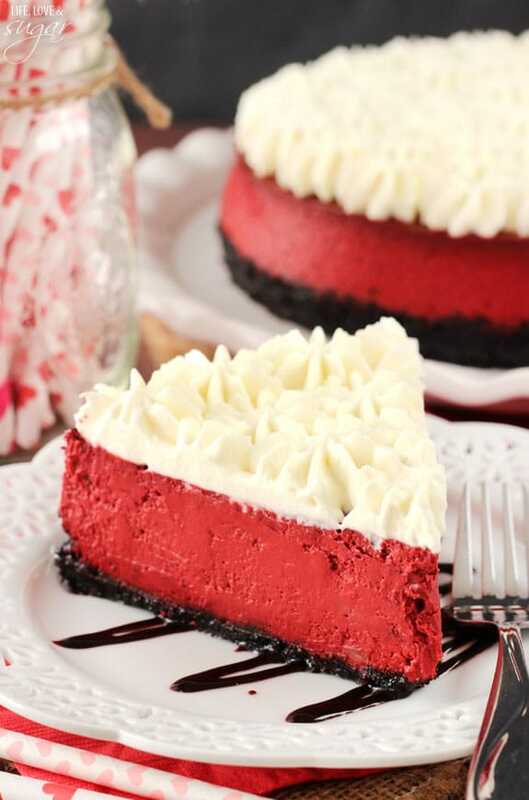 That gorgeous color… That cream cheese whipped cream… I am SO wishing you’d be my valentine this year so I could taste a slice of this! 😉 Pinned! This is absolutely stunning looking!! 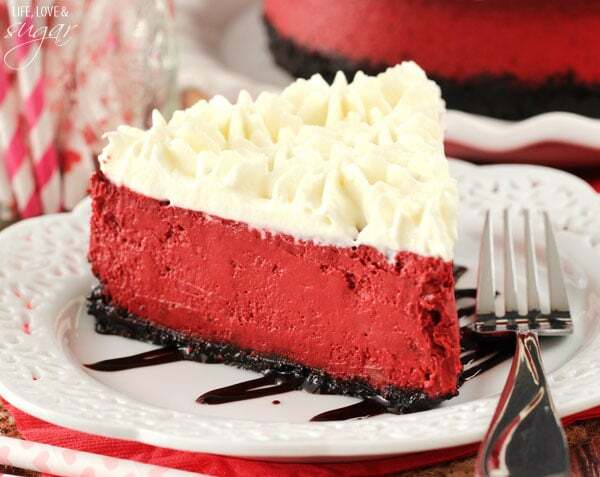 The dark chocolate crust, the red velvet cheesecake, the cream cheese stars on top! I am star struck just looking at your gorgeous photos!!!! 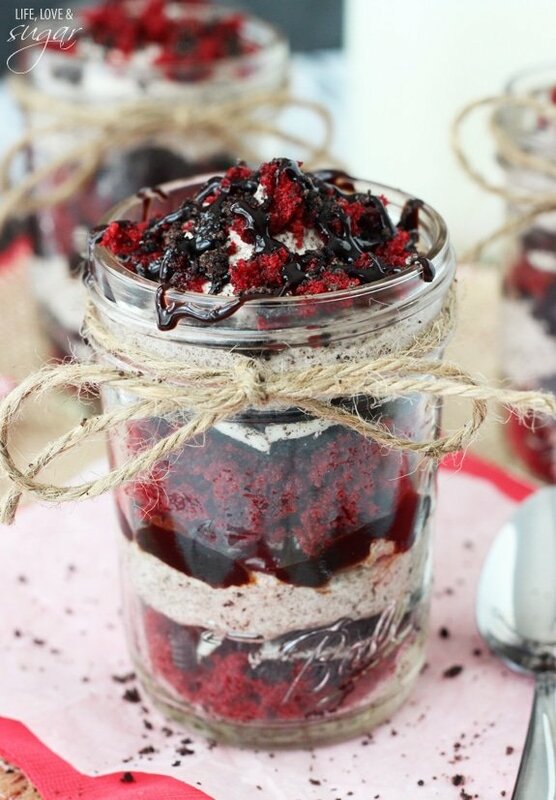 looks so pretty, definitely would like to try making it next week for vday. what type of vinegar did you use please? It’s white vinegar. Enjoy it! 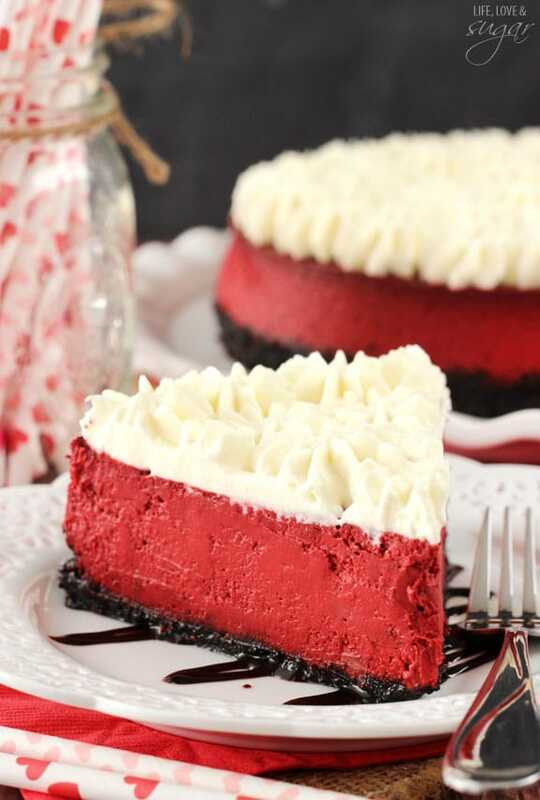 I love the idea of this cheesecake! Thank you for the recipe. I’d like to try it in 4″ springform pans instead of a 9″. How would I adjust the baking time? I haven’t ever done them as 4 inch cheesecakes before. I had someone comment on instagram though that she did and baked them for an hour and 10 minutes, then let them sit in the oven with the door open for 20 minutes. Here’s a link to the comments, so you can see what she said. I’m sorry for the confusion. I added a note to the ingredients, but I actually use a canned whipped icing. You could make one if you prefer. This was a hit! It was so beautiful that everyone thought it was store-bought! I had to use probably close to 30 Oreos for the crust, and I added an extra half a cup of icing (Duncan Hines) to the whipped cream. Made this recipe today…haven’t made a cheesecake in quite some time, I am always a bit disappointed on the outcome vs. time and effort. However this particular cake turned out fantastic. Flavor is spot on, and it was smooth and silky. Excellent recipe that I will be adding to my keepers. Where can someone purchase your book .Your recipe looks very interesting. My cookbook isn’t actually available yet. It won’t be published until October. You don’t have to do the water bath, especially if making into cupcakes. The center of the cheesecake just might fall a bit. I’ve attempted this recipe twice!! And I followed it exactly, both time it was a runny mess that just fell apart. i don’t understand why!! It’s very aggravating I spent over 3 hours making this and it never turns out. Done with this recipe.. I’ve made other cheesecakes in a water bath and they turned out fine. It doesn’t make sense to me why this one doesn’t work. I really do hate to hear that. I know that’s frustrating. I just made this again last week and it turned out great, so I can’t imagine what’s going wrong. Seems very strange that it’d be runny. Almost like it’s undercooked or too much of a liquid ingredient was added? Hi there, I baked this cake yesterday but I did not put as much food coloring as the recipe called for because I was afraid I was gonna put too much. What I’m wondering is what kind of food coloring you used; paste or liquid and which brand. Thanks in advance. I just used regular McCormick Food Coloring that you find by the spices in the grocery store. I leave the cream in the Oreos. I think cream cheese would be ok, though I haven’t tried it. Just make sure it’s room temperature so that it incorporates easily. My springform cheesecake pan always leaks oil when I make cheesecakes with a cookie crust. I’m not sure its secure enough to do a water bath, and if its covered in the icing, I’m not too concerned about cracks. If I do it without a water bath, do I need to adjust baking time? Will it not set correctly or just have a greater chance of a crack? Thanks! I actually just posted last week about how I prevent my water bath from leaking, if you want to check that out. If you aren’t going to use the water bath then yes, you’ll want to reduce the baking time. It should set correctly, it’ll just bake quicker and more than likely fall in the center as it cools and possibly crack. If that doesn’t matter to you, it’ll still taste good. I’d suggest baking closer to an hour. Watch for the edges to be set but the center to still be a bit jiggly. I’d still recommend following steps 9 and 10. I haven’t actually made this as cupcakes so it’s hard to say. 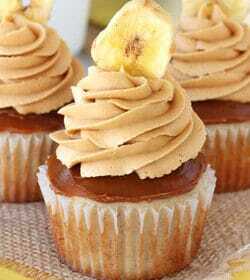 Here’s a version of cheesecake cupcakes that I’ve made. The method should be similar. I would definitely recommend it. Without it, the cheesecake will likely fall in the middle when it cools and is more likely to have cracks. If you decide not to use a waterbath, you’ll likely want to reduce the baking time. What tip do I need to pipe the whipped cream out like you did on this lovely cake? I made this cheesecake a few times for friends and family. They all loved it!!! I have an amazing recipe for red velvet cupcakes that everyone always asks me to make but for Christmas I wanted to step it up a bit. I decided to go with this recipe since it had similar ingredients and I’m so glad I did. 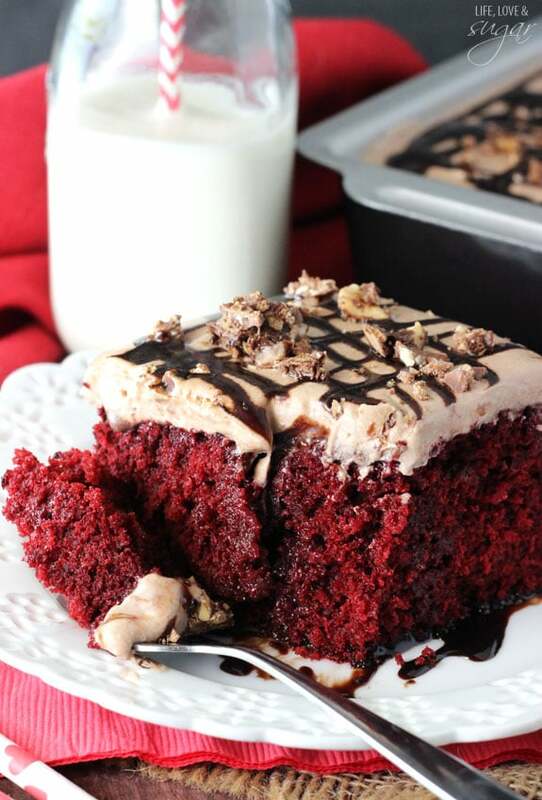 This was absolutely an amazing cheesecake recipe…that tastes just like red velvet should. 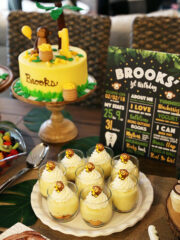 Thank you so much for sharing…it was a huge hit with my family who has become rather spoiled when it comes to desserts. Awesome! 🙂 I’m so glad you were happy with it! Thank you for this and so many of your other recipes. 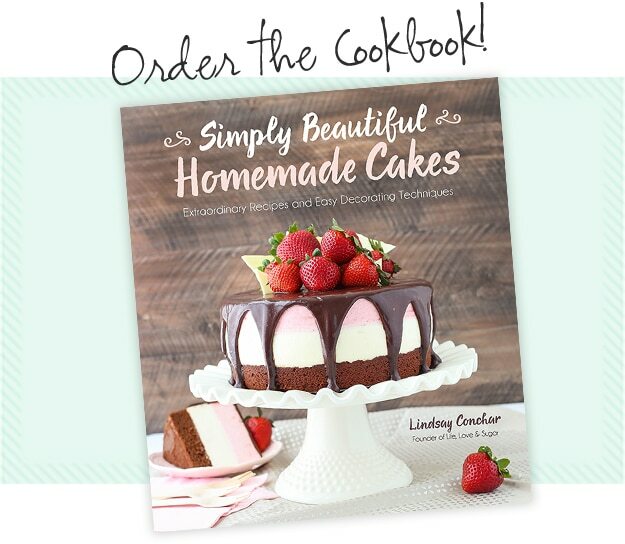 Your baking style is right up my alley! I brought this into the office and people couldn’t stop talking about it. I only made a few slight changes. 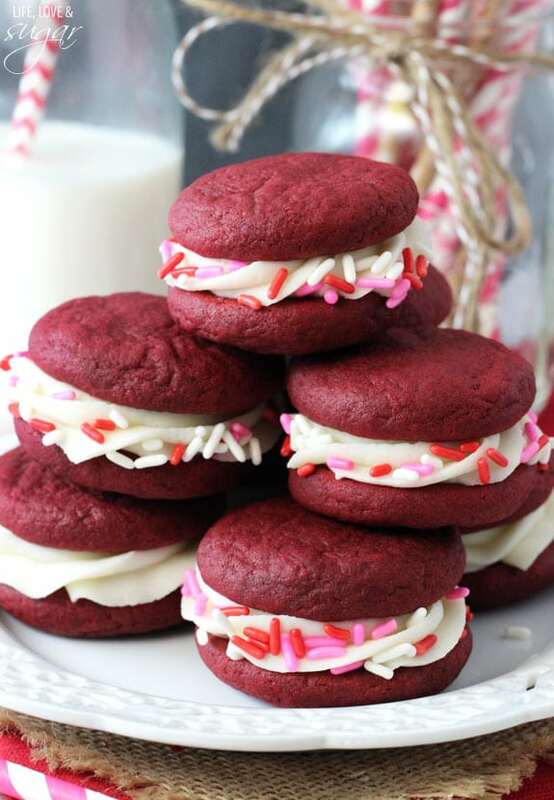 As I reached for the Oreo cookies, I saw the Red Velvet ones and couldn’t resist using those instead. I also hate to buy an entire carton of buttermilk just to use 1/4 cup, so I put 3/4 tsp of lemon juice in a 1/4 measuring cup and filled the rest with millk. I thought I had red gel color on hand, but didn’t… all I had was a partially used 1 oz bottle of red liquid color. The color was still a nice dark red. I just couldn’t bring myself to use canned frosting, so I made my own cream cheese frosting. I added the 1/2 cup to the whipped cream and after tasting it, added 1/4 cup more. I wanted it to be a little heavier… and maybe I just wanted to use up more of the frosting that I just made! I love the idea of lightening up the cream cheese frosting with whipped cream… genius! 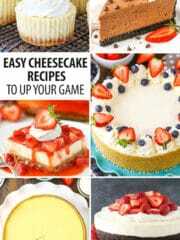 I’m always amazed at how many different ways there are to bake a cheesecake. I followed your instructions except my water bath wasn’t as high as instructed (because I used a cookie sheet), but everything cooked just fine. Thanks Angela! Yes, I use unsweetened cocoa. Not sure what you mean by deep dish. 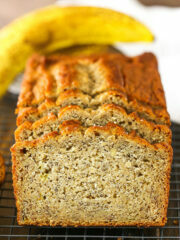 It uses a springform pan, which is generally close to 2.75-3 inches in height. I made this for clients this week and had leftovers or my husband. I regularly make cheesecakes but wow! This was amazing! My husband keeps saying how i knocked it out of the park with this one. My clients loved it as well – thanks – I’ll be making this again! 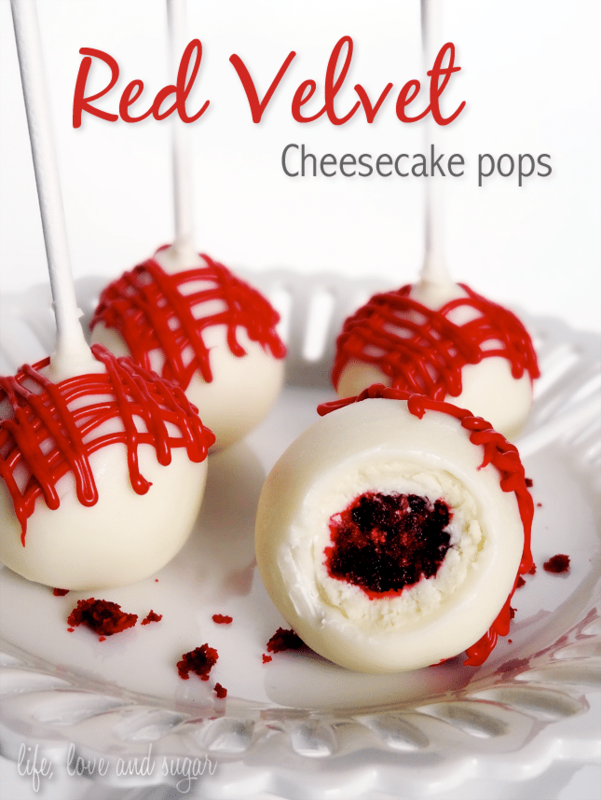 I am going to be making cheesecake bites for a dessert for a wedding. They want red velvet and square cheesecake bites. Do you think this recipe could be made in an 8×8 inch square pan if i lay foil down in the bottom so that I can lift it out? This is probably big enough for a 9×13 pan. You’d want to cut in half for an 8×8. Thanks for the response. How thick do you think they would be in a 9×13? Since they are mini cheesecakes I would like them to be somewhat tall. Not thin like cheesecake bars, if that makes sense. I just made this cheesecake, it’s in the oven now. But is it normal for it to look more like a dark purple then red? I used more then enough food colouring maybe even a little extra. Hmm, I don’t recall it looking purple. Did it turn out ok? Hello! 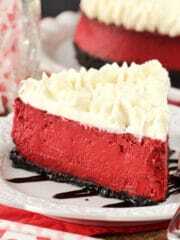 Came to this recipe looking for other cheesecake to try – gonna try this during Christmas time! 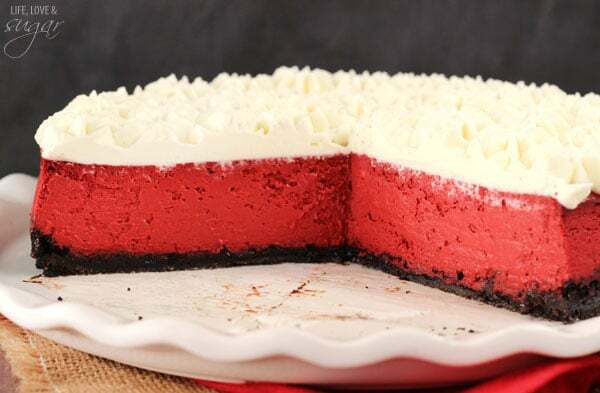 Red is perfect for Christmas but I have a question – when you do the Oreo for the crust do you use the filling as well? And just the regular Oreo not double stuff? I will be making this, this weekend, for my daughter and taking it to her as a surprise gift. 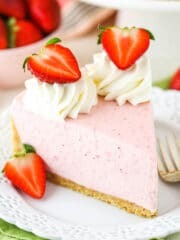 I love the simple beauty of this cheesecake already but, is there anything that you could recommend garnishing the top of the icing on the cheesecake with that would taste great with the other flavors in the recipe and also give it a beautiful flare? 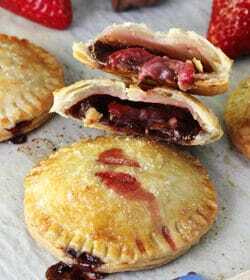 Are there any natural red food dyes that you could suggest to use that wouldn’t alter the flavouring too much? Thanks 🙂 so excited to make this. I’m not familiar with non-flavored alternatives, I’m sorry. Are you sure you used “heavy whipping cream” and the full amount of powdered sugar? It does actually make a difference. Yes, Heavy Whipping cream. I used Pillsbury Creamy Supreme Cream Cheese frosting. Used a KitchenAid stand mixer. The Whipped cream was stiff until I added the frosting. Did I not Whip it long enough before adding the frosting?? The cake flavor is spot on Red Velvet!!! Hi!! I have been struggling to find a good red velvet cheesecake, so I am excited to try this, but I have a question… Why the vinegar if you already have the buttermilk? Is it too much tang or does it balance with the cocoa powder? Thanks! I don’t think it adds too much, but that would be my opinion. You can certainly leave it out, if you’d like. How long does it need to chill before served?? It usually takes about 5-6 hours to chill.